myofficeinnovations has no other items for sale. Sales tax may apply when shipping to: AL(12.5%), AZ(12.9%), AR(12.25%), CA(10.5%), CO(11.2%), CT(7.35%), DC(10.25%), FL(8.5%), GA(9.0%), IL(11.5%), IN(7.0%), IA*, KY(6.0%), LA(12.2%), MD(6.0%), MA(6.25%), MI(6.0%), MN*, MS(8.0%), NV(8.265%), NJ(8.625%), NY(8.875%), NC(7.5%), OH(8.5%), PA(8.0%), SC(13.0%), TN(9.75%), TX(8.25%), VA(7.0%), WA*, WI(6.75%). Arrived Quickly and Exactly as Described. Recommended Seller. Thank You!! Great service will do business again. Perfect storage for many applications! 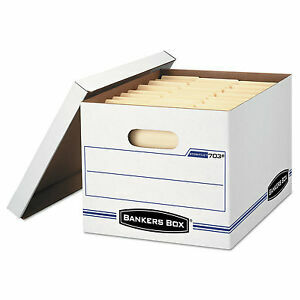 I have used Bankers boxes for the past year after doing away with other size storage boxes for my paper files. They take up less space and when I need to locate a document/file, they are easy to find. This product is sturdy and of exceptionally good quality. They are even attractive should your storage be seen by others, intentionally or not! 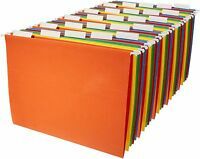 I use labels to mark the contents and if my filing needs change or the files in a given box become obsolete and need to be shredded, the label can be easily changed. Recommend this product! In the past 10 years I have moved 4 times each time planning to stay forever. Times are moving so fast, we must move with them. Having bulky furniture for hired movers to load is expensive. So I bought many bankers boxes planning to use them instead of dresser drawers so my next move will be half packed. I have many hobbies and now each one has boxes of its own to store and label for easy retrieval. These boxes are just the right size to fill and not be too heavy for me to lift. They are easy to put together, stable, and stack nicely. Highly recommend. Good quality for a great price. Perfect size for packing up things for storage or moving. Easy to assemble and the handles make moving the boxes very easy. Perfect size so as to not over fill, leading to excess weight. These boxes are great for storing files, or can be used for storing whatever you can fit in them. I will definitely order more.